One need only gaze at a classic red rose arrangement, like this one, to see why. Red roses are stunning, dramatic, and they say so much - without saying a word. Deluxe - Includes BB & Bow ! Vase may vary from picture... depending on availability clear vase may be substituted with red vase ! 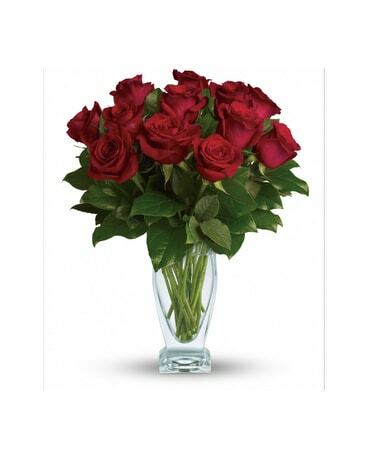 A dozen red roses with greens & bow are arranged in a vase. A perfect way to say " I Love You "